Happy Thanksgiving to you! Sounds like your life is getting better, Thanks to the Lord! I love your Cornucorpia card, very beautiful! What a beautiful post, Melissa! God is so faithful, even when things (from a human perspective) look very impossible. I'm so sorry for all that you and your children have been through. Melissa, this is gorgeous!! Beautiful post and I am so thankful for our friendship. Keep your faith as you have become a stronger person with it. Love ya! Beautiful card, love how you cut out the cornucopia. So sorry for your recent troubles, but you sound like you are very grounded in your faith and that it is carrying you through these difficult times. I love your card! That cornucopia is so pretty and colored so wonderfully! Lovely gate fold card! Thanks so much for playing with Just Us Girls! The card is so beautiful and I love the warmth of it. I am so proud of you because you did hang on and made the best of days that seemed so hard. You hung onto God's promises and they have helped you through. I love the saying you quoted, "God's answers are never late, rarely early, but always on time." Hi Melissa, I love this card! The colors and design are fabulous. 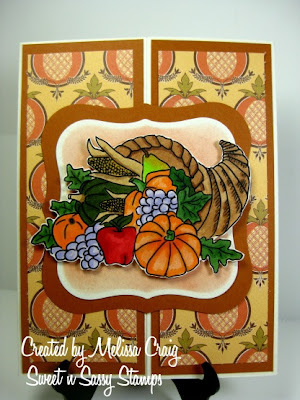 Gorgeous cornucopia card!!! Very festive. Great colors. Thanks so much for playing along with Just Us Girls! Great Thanksgiving card Melissa! You did a fab job with the gate fold this week! I'm so glad that your life is in an upward swing now! Grogeous coloring on this cornucopia, Melissa! You've shown amazing strength surviving the curves life has thrown at you. Way to go, friend!! Fabulous! I love the fall colors and the precise layers of your card. Thank you for playing with Just Us Girls this week!